I have a tendency to start garments I am very excited about at the time, but then I run into a slight challenge—a fitting problem or a serger malfunction or just my own tendency to sew so late at night that I start attaching the pieces together backwards... And I throw the item in my "in progress" bag and it never sees the light of day again while I start making something else new and shiny. 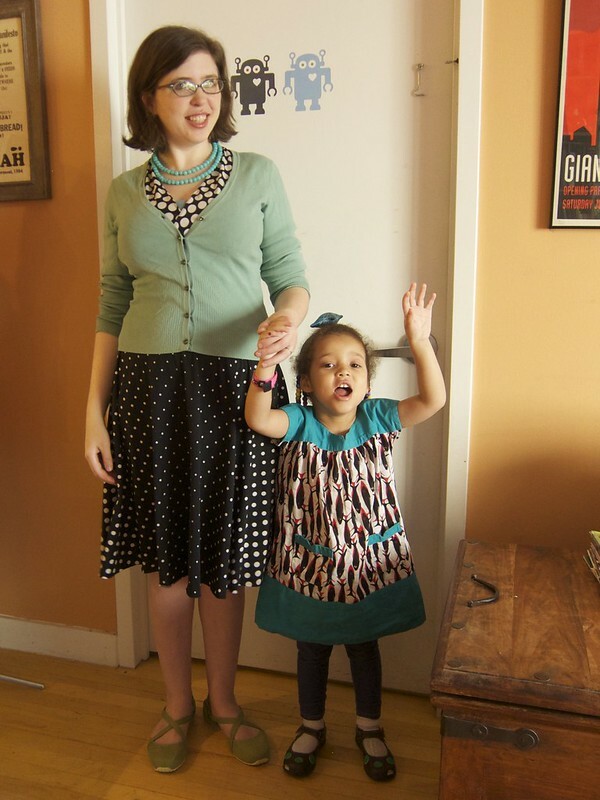 I've now finished the Cake Patterns Red Velvet Dress (see finished object post), my chevroned Cake Patterns Hummingbird Blue peplum top with swiss dot dickey and cuffs (see finished object post) and my Delancey cardigan by Alexis Winslow. I also just decided to toss a few objects and definitely decide NOT to finish them (like my blue silk bias half-slip that I hadn't really cut out properly or the bras I had started making in a size I no longer am). It felt equally freeing to just admit it was NOT going to happen. The UFO bag is almost EMPTY. And wow is it a good feeling! It was also fun to get to start these projects at the sewing stage, instead of the cutting out and alterations stage. For Mother's Day my husband took us to the AMAZING Charles James Beyond Fashion exhibit at the Costume Institute at the Metropolitan Museum of Art. 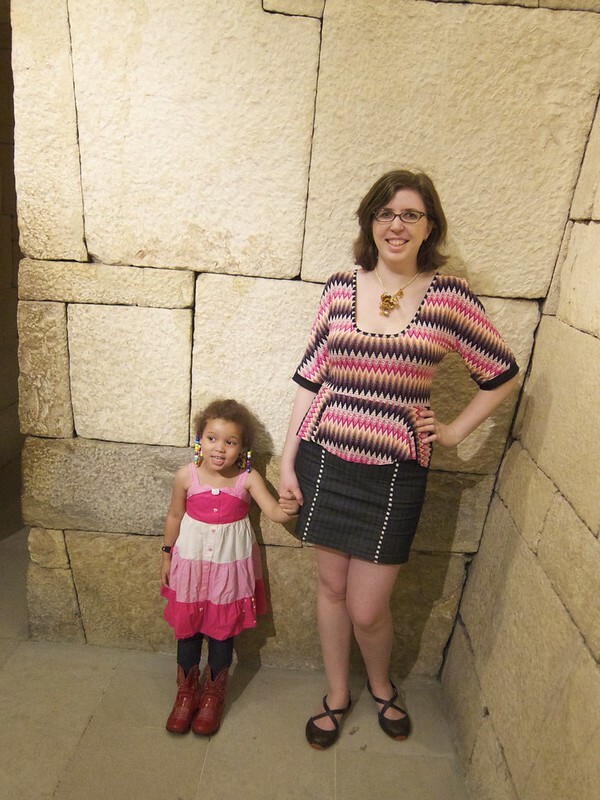 No photos allowed, so here are my daughter and I in front of Perneb's Tomb. Top: Partially finished Cake Patterns Hummingbird Blue before I attached the cuffs and dickey (blogged here). Shoes: Ahnu Karma flats because I wear the same comfortable shoes over and over again. As anyone who reads my sewing blog (or even more so my food allergy/ recipe blog Safe & Scrumptious from Scratch) knows, my three-year-old daughter Z has severe multiple food allergies. She's allergic to sesame, nuts, peanuts, milk, eggs, mustard, cumin, poppy, canola and peas. So we don't eat in restaurants or buy much processed food, and we ALWAYS carry two EpiPen auto-injectors with us and make sure she wears her allergy alert bracelet. Today was day two of Food Allergy Awareness Week, and today's action was #tealtakeover — since teal is the official color of Food Allergy Awareness. There are 15 million Americans with food allergy—and many, like my daughter, at at risk of life-threatening anaphylaxis. Please think about the food allergic people in your life—and what you can do to make them feel welcome and safe! Learn more at www.foodallergy.org/. 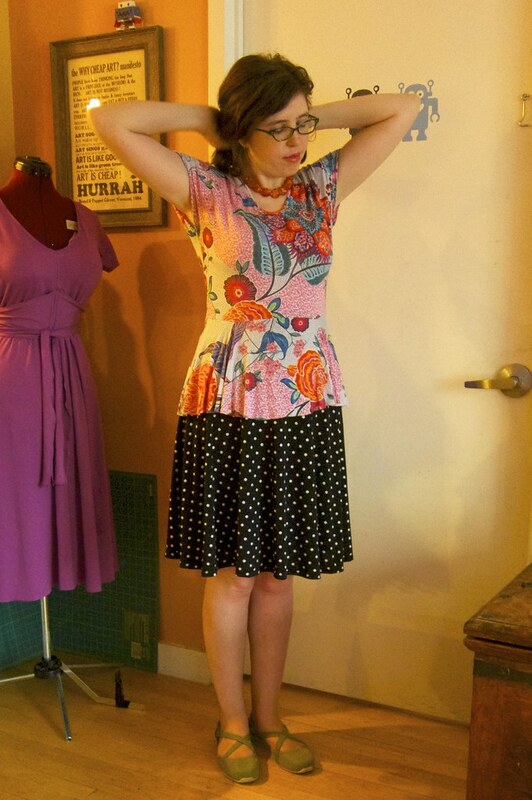 Dress: Me-made McCall's 6070 ombre polka dot dress. Shoes: Another pair of Ahnu Karma flats, in a green vegan mesh version. On Z: A she-made starfish headband and me-made wax print Oliver + S dress (technically the "Ice Cream Dress" but she's allergic to dairy, so we call it the "Coconut Cream Dress"). The no longer un-finished UFO. Top: Fully finished Cake Patterns Hummingbird Blue (blogged here). Jeans: Not Your Daughter's Jeans naturalish-waisted straight legs (bought at 6pm.com for less than 50% retail). They're supposed to be natural waisted but they hit me a few inches below that. Oh, these Vogue Elements 9745 wide-legged trousers just make me want to cry. 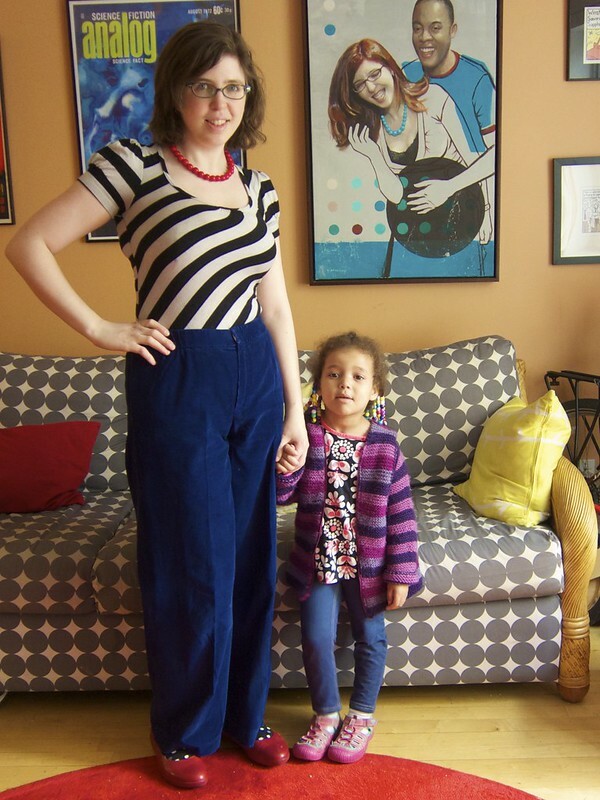 When I first made them I was super into them—they are a beautiful shade of blue, they are corduroy, they are my first pair of successful non-pajama me-made trousers and they fit and they are SO COMFORTABLE (partly due to the hidden elastic waistband). Yet I haven't worn them since Me Made May 2013. Mainly because my husband who usually loves everything I make hates them and says "they aren't very... flattering." I like wide legs in theory but I think I will stick with more fitted styles... they seem to work better on me. My daughter is wearing her Tomten Jacket I knit for her a few years ago—she's finally growing into it. These two items (along with the Georgina cardigan I ended up throwing on to beat the spring chill) are my most-frequently-worn me-mades for sure—I always feel comfy and happy in them. I rarely wear them together but decided to give it a go and I THINK it works, no? Hummingbird peplum knit top in a hummingbird-colored rayon jersey that needed some VERY careful pattern placement (blogged here) and a self-drafted knit half circle skirt with simple no-elastic waistband (free tutorial here). 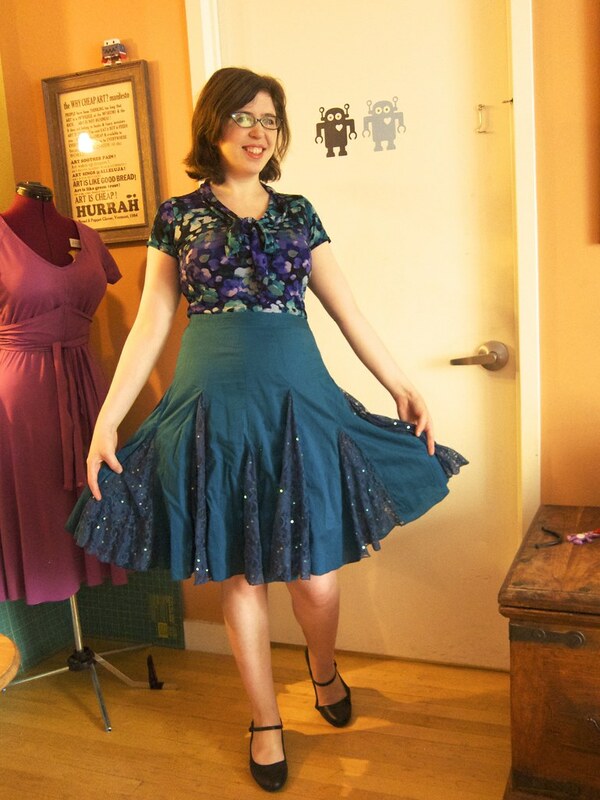 This Friday's theme for the Me Made May challenge was "Too Pretty to Wear Pants" but since I wasn't exactly sure what that meant, I took it to mean: wear a skirt or a dress, maybe something a little extra girly? The me-made here is a trusty Jalie Scarf Collar knit top (blogged here). Most of my photos so far have contained just one or two me made items... 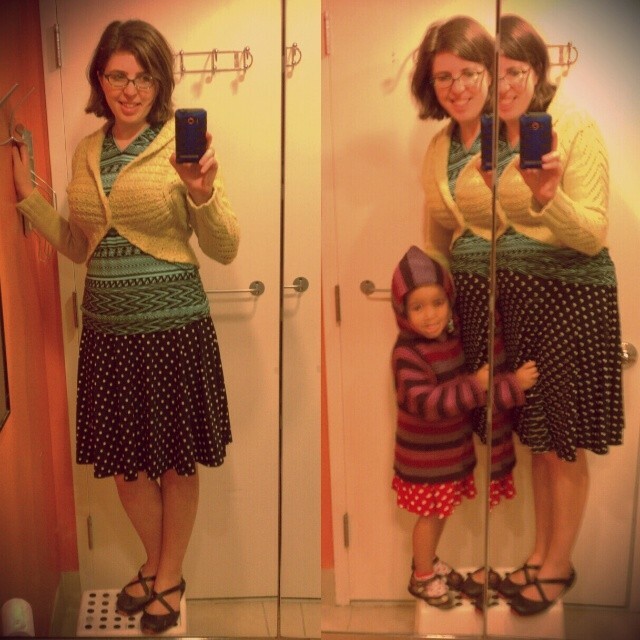 But there are five me mades in this collage if you count my daughter's sweater and some hidden underthings. And six if you count my daughter herself! So tell me—how many UFOs are in your pile? And how do they make you feel? Holy Cow, M, this post is epic! A couple of thoughts: I seriously sympathize with you over Z's serious allergies. I may have mentioned before that my sister has numerous serious allergies and has to carry an epipen everywhere. On the plus side, she's still here at 41 - and she's got many coping techniques / workable ways of eating that she's learned over the years. The job you're doing now is so hard - and I'm sure SO stressful. But one day it will be less stressful. keep on! On another note, your husband is crazy. Those pants are awesome and sometimes you just have to say: you're wrong, crazy husband. Ask me how I know. I'm so impressed by how you've got your crafting motivation back - and by how you've turned it into such productivity. Given the responsibilities of working mothers of young kids (esp. ones who need very special meals which can take a ton of time to prepare), it's all the more impressive. I don't know, I think he has a point—wide-legs in flowy linen are one thing on me, but maybe not in stiff corduroy. I feel like the blue cords would look awesome if you chopped them to calf/knee length. Also, did you make the awesome shirt you're wearing with them? 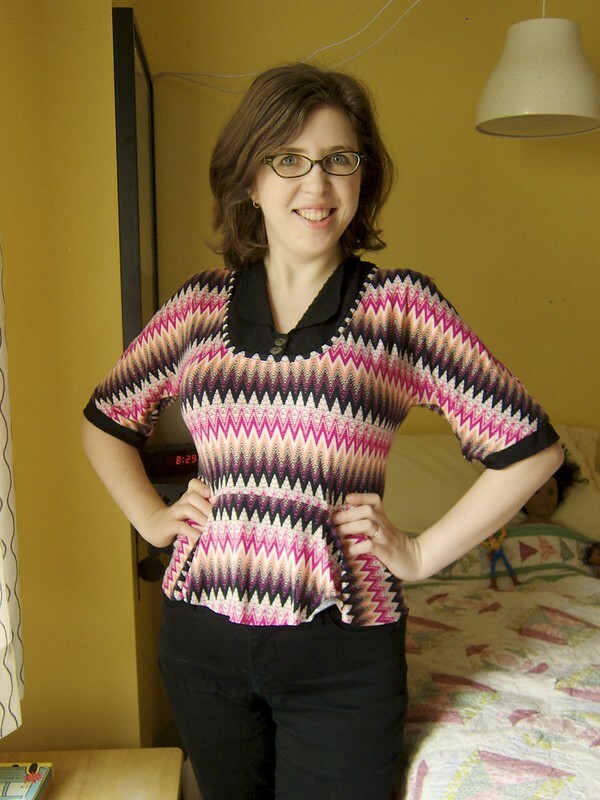 I live the idea of bias horizontal stripes on the front. Maybe...we shall see. I didn't make that top but I wish I had and want to make one like it! This post hits close to home! I too get really pumped for new projects, then let them sit for a long time because I hit a snag. I have a few too many UFOs and feel dreadful about it. My behavior is quite ridiculous: I realise now that most of these "snags" seem bigger then they really are. Bottom line: I just need a good kick in the pants! For example, I was frustrated last night because the zipper I inserted into my bias bodice dress is looking wonky when I put it on. After some research, I figured out I need to unpick the entire zip to fix the problem. The thought of this was too much for me. This morning, I was tempted to put the entire project on the backburner (meaning UFO pile! ), but this post just convinced me not to. Oh, I TOTALLY get frustrated by wonky zippers... unpicking always makes me want to scream. But hurrah that you unpicked it and fixed your problem! 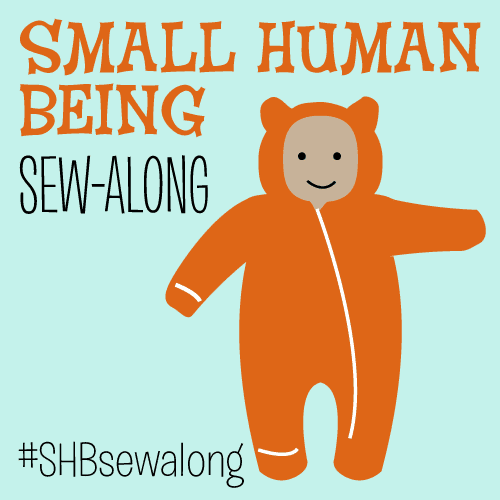 I am so impressed with all your awesome sewing lately. You are a machine!! :) My UFO pile is pretty impressive. I just cleaned out my sewing room and found things I cut out during this last year that I didn't remember cutting out! I'm out for the summer in three more weeks so I'm hoping to get some sewing time soon. 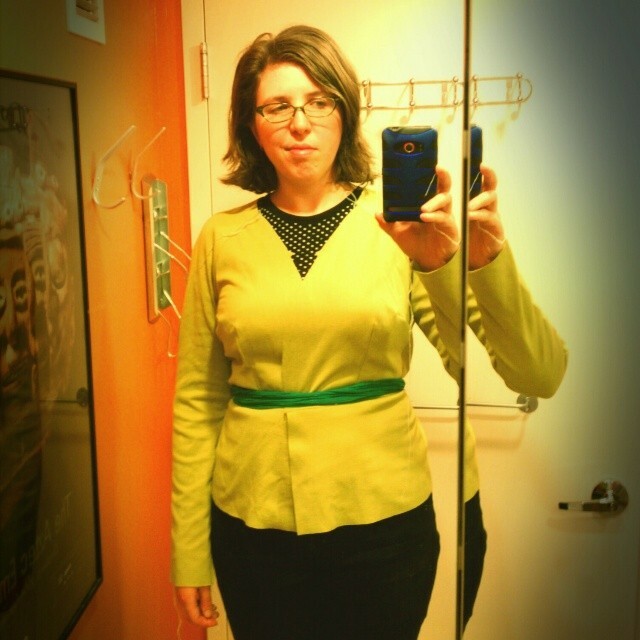 I love that peplum top that's one of your most worn items. Such cool fabric! If you don't remember cutting it out it's like someone else cut it out for you! :) I can't wait to see what you make this summer. Don't be too impressed, though... you wouldn't believe all the things I am neglecting (dirty dishes everywhere, piles of clothes... my husband is doing all the cooking right now too). No sewing UFO's for me for the past two years. (There are some knitting ones, though). I sew at least two items a month. My skills finally got good enough that I don't stop a project when I run into an issue - I don't start a new project until my last one gets finished. Next good habit that I want to work on is not buying any fabric until my last project is finished. That's super impressive! And that fabric one is so hard... I am trying to make myself sew from stash or from recently bought fabric but then I'll want something SPECIFIC like denim (no denim in stash) and decide I HAVE to buy it. So much good stuff! Thanks for sharing the freedom that comes from working through the UFO pile. I'm going to have to keep this in mind! Aw, thanks! I'm not promising a new UFO pile won't build up but I'm going to try to be a bit more persistent in finishing a project or just actively saying "I will NEVER finish this." As you can see, my technique (highly effective) is total denial. I love your MMMs!! So many great outfits! ha ha ha. Denial is one method! Amazing job on getting all those things finished up. I rarely have unfinished things as I'm a one project at a time person but my mending and alterations pile is pretty terrible so I am working my way through that. Looks like your mmm is going great! 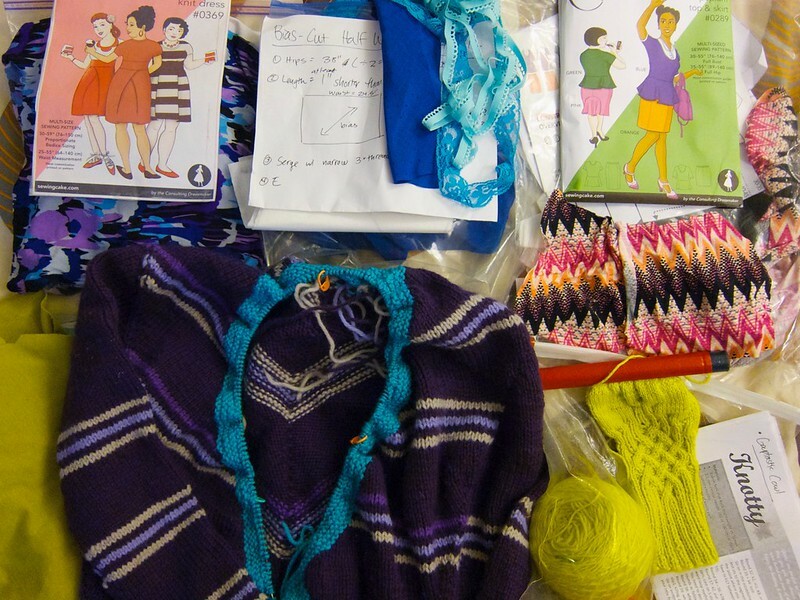 Funny you mention that, I have been on the mending pile too... I started carrying my mending to work so I could do it during lunch. And I've been mending at the dinner table, last night I fixed my husband's favorite jacket, a sweater of mine and a slip.